But for real - did you not think the whole "I'm going to get around international law and introduce an invasive non-indigenous species to two new continents" idea was a little morally shaky? Even with the addition of Morgan Freeman's (a.k.a. God) narration/leadership? Interesting point. I never really thought about the possible environmental backlash... that could set a really bad precedent. 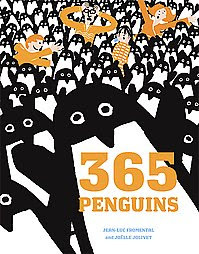 But, if we do have to be overrun by an uncontrollable non-indigenous animal species, I'm glad that it's penguins (real penguins... not obnoxious showtune singing computer animated penguins). Plus, they're already so well dressed, they could waddle right in and take over Congress tomorrow. And honestly, could they really do that much worse?